Our awesome group of friends at our table. The Derrick Team is always proud to be a sponsor of this fantastic fundraiser for HCHS! More photos courtesy of the Hendricks County Humane Society, (see more on their FB page). 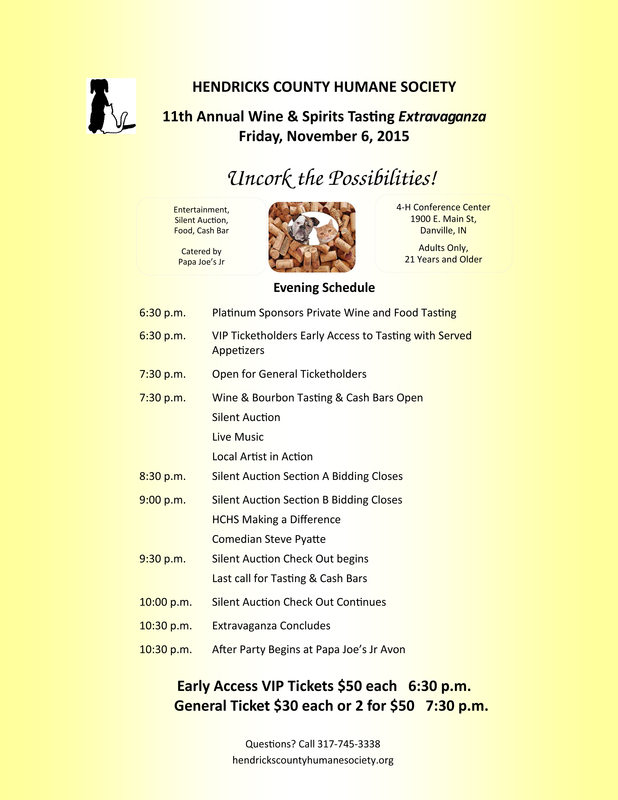 Once again we’re looking forward to one of our favorite events in Hendricks County, the HCHS Annual Wine Tasting event. This year it’s been expanded and moved to the Hendricks County Fairgrounds. As usual The Derrick Team will be one of the sponsors but we really excited about all the extras this year. Find out all the details on the flyers below or at the Hendricks County Humane Society’s web site. Come out and support our local Humane Society and everything they do for Hendricks County animals. We’ll see you there! 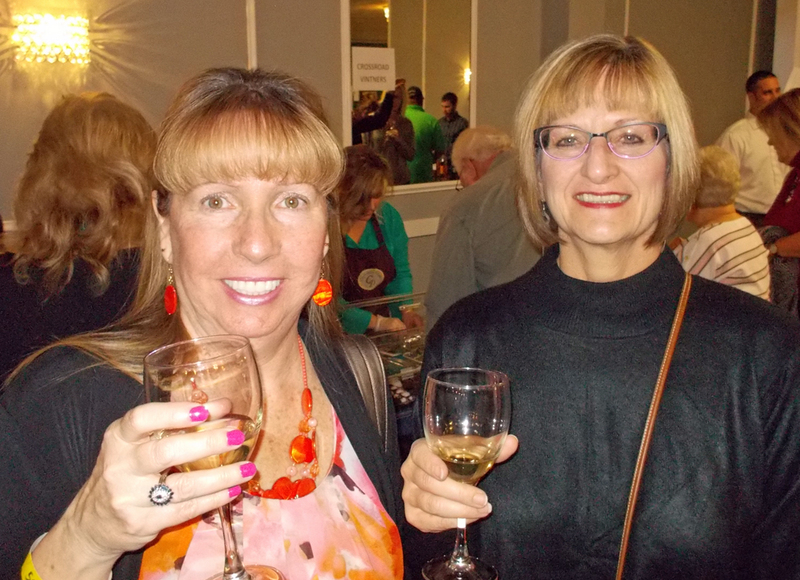 Connie and Elaine having a great time at the 2014 wine tasting. Finding homes, saving lives is the mission of the Hendricks County Humane Society. 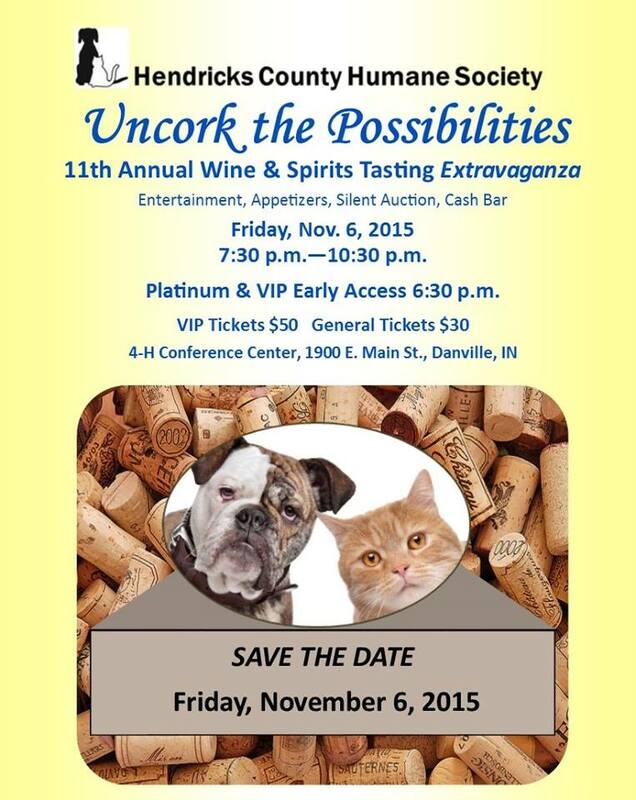 To fund its many programs in pursuit of that goal, on Friday, Nov. 6, the HC Humane Society will host its 11th Annual Wine & Spirits Tasting Extravaganza at the 4-H Conference Center in Danville. The event begins at 6:30 p.m. for Platinum sponsors and VIP ticketholders and at 7:30 p.m. for general ticketholders, ending at 10:30. The festive event, emceed by Buffy Phyne of Pet Pals TV, includes live music, comedian Steve Pyatte, and wine and bourbon tastings. Cash bars will offer beer, wine, and cocktails. A multitude of Silent Auction items include a $2,500 hardscape for your landscaping delight and a Colts game ball autographed by Andrew Luck. Throughout the evening local artist Dane Grubbs will be creating a painting for sale in the Silent Auction. In 2015 as of August, the HC Humane Society spent $19,545 on medical needs, spent $14,644 on spaying and neutering, found adoptive homes for 158 cats and dogs, and through its Pet Food Pantry program distributed 26,057 pounds of food. Thanks to Papa Joe Jr’s Italian Restaurant of Avon and Ray’s Trash, all money raised at the Extravaganza will directly fund these programs. On behalf of the cats and dogs, the HC Humane Society is grateful for attendees and sponsors, without whose contributions our work would not be possible. Major platinum sponsors include Allen & Scott Enterprises, Edward Jones-Harold Tinsley, Hendricks County 4H Fairgrounds and Conference Center, Hendricks County Flyer, Ray’s Trash, and The UPS Store-Brownsburg. All adult guests aged 21 and over are welcome to attend this exciting event. VIP tickets are $50 each and general tickets are $30 each or two for $50 and are available at Big Red Liquors in Plainfield or from the Humane Society website www.hendrickscountyhumanesociety.org or at the event. As usual everyone had a great time at Dogtona on March 28th, The Hendricks County Humane Society’s spring fundraiser. 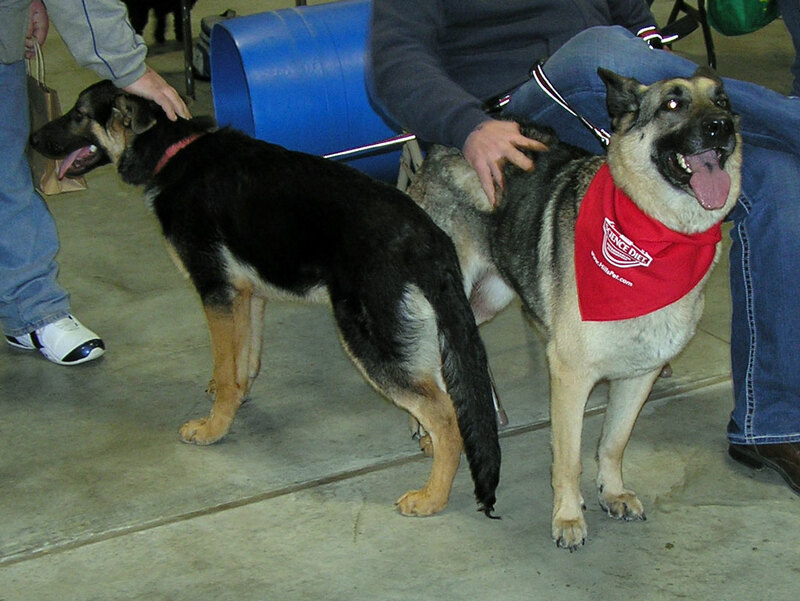 Our dogs Juno & Bailey had a blast and Juno was on the front page of the Hendricks County Flyer the following week. Be sure and check out the complete video below! The Derrick Team loves to sponsor events like this! Time For Dogtona 2015 From The Hendricks County Humane Society! 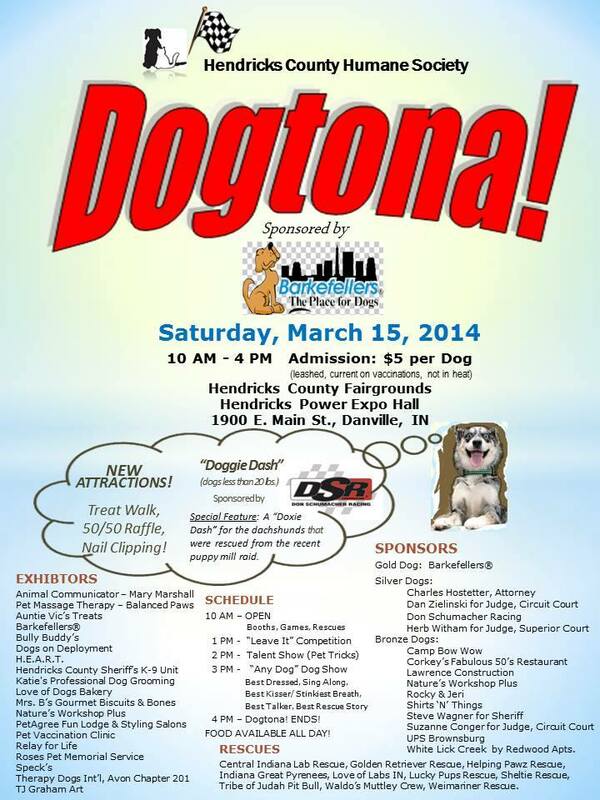 It’s that time again that all dogs love in Hendricks County, Dogtona! 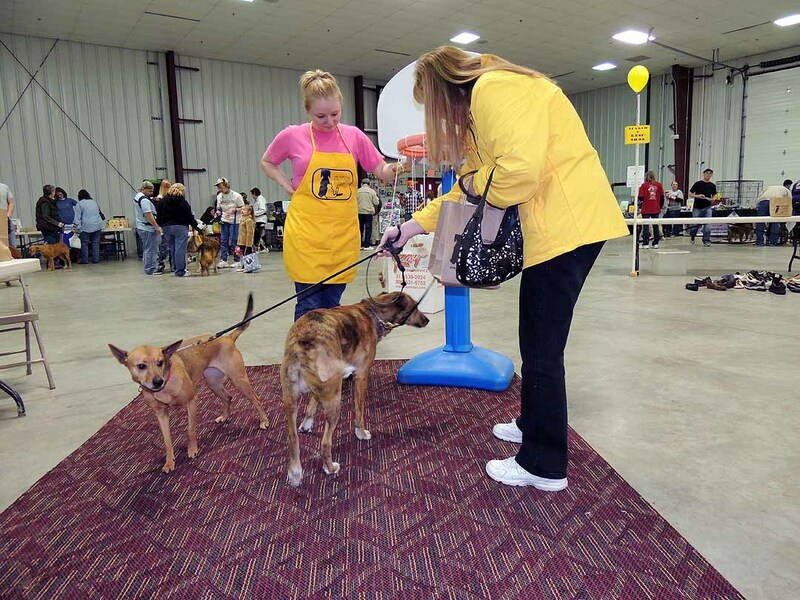 The event is held by the Hendricks County Humane Society at the Hendricks County Fairgrounds from 11:00 AM to 3:00 PM with all sorts of fun things for dogs to do. This is a must see event, even if you cannot bring a dog. Check out photos from last years event below. See you there! Find out all the details at the Hendricks County Humane Society web site. Once land was purchased and prepared for use by the new owner they often asked that the county vacate the road across their new land. This is evident in early records of county proceedings in various meeting documents in archives. For roads still used the solution often was to reroute the roads along the property lines. Of course when mostly used by slow foot and horse traffic 90 degree turns weren’t much of an issue. Today these corners are usually marked with tire skid marks from inattentive drivers. If you live on a tricky road or a neighborhood, we will be happy to help you sell your home. Call or text The Derrick Team today at 317-563-1110 with any of your real estate needs. 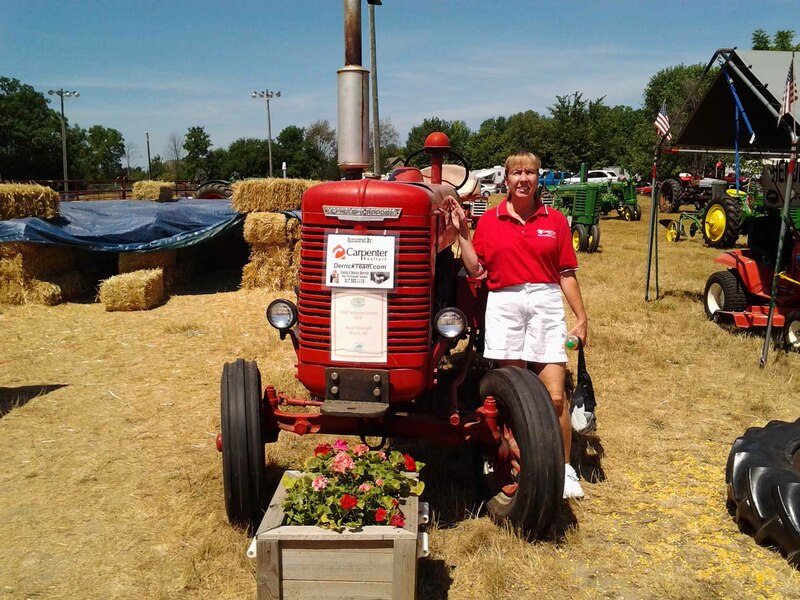 Connie with Noel Brumm’s 1947 International ID 6 tractor we sponsor at the Antique Tractor display at the 4-H Fair. Bring Your Dogs to Celebrate 11 Years of Dogtona! Juno, Bailey, & Connie Having Fun! Bring your pals to the 11th Annual Dogtona! Every year Hendricks County dogs get to enjoy the best event ever created, just for them by the Hendricks County Humane Society! Local doggies get to dress up and strut their stuff for a day just for them. The fun starts at 11:00 AM at the Hendricks County Fairgrounds – Hendricks Power Expo Hall so it can be rain or shine! The cost is $5 per Dog, but the people who bring them can enjoy the fun for free. All proceeds support the Hendricks County Humane Society! More details on the flyer below. Non-profit animal related booths and adoptable dogs! Fun competitions: Any Dog-Dog Show, Clever Pet Tricks, Leave It Contest, Talent show, and more! The Derrick Team be there shooting photos and videos and having a great time. Both our dogs Bailey & Juno had a blast last year (click for video). Roundabouts: Love ‘em or Hate ‘em? We know that local governments have to look for solutions that solve issues and a common way to do this is looking at what other communities have done to address the same issue. The “Let’s see how that’s working for them” mindset. When it comes to traffic control in the Indy metro area, the city of Carmel in the northern metro area jumped in with the trendy solution to busy intersections by installing roundabouts, and are still adding more every year. Saying it’s been used in Europe for a long time and is a proven way to ease busy traffic flow was they typical reason given for the decision. Whatever the reason, they’ve embraced it so other local governments are paying attention. Avon was in the same predicament and after paying for traffic studies decided to “give it a go” as the British would say. With 5 done and more in the planning stages, they really jumped in with both feet and aim to be the #2 roundabout community in the Indy metro area. From a personal perspective I was skeptical because of what I saw in the early stages of Carmel’s rollout. Traffic flowing smoothly until granny pulls up and will not enter the roundabout if ANY cars are in the circle resulting in long lines of backed up traffic. The other issue is roundabouts tend to bring out the aggression of those many aggressive drivers in Carmel. The fundamental requirement for smooth flowing traffic at a roundabout is being polite, paying attention (not texting or yaking on the cell phone), and slowing down to safely drive through. None of these are common in Carmel drivers. So when Avon announced their plans I was dreading the fact I would be required to use roundabouts to get anywhere in the area. Fast forward to today and after a couple of years of use, drivers in this area generally follow the requirements listed above and traffic does generally flow better through our area roundabouts. So now my skepticism has abated as whether this was a good move by the town of Avon. The interesting part will be to see as the town grows and traffic increases, will these current designs be able to handle the traffic as smoothly as it does now. As you approach a roundabout there will be a YIELD sign and dashed yield limit line. Slow down, watch for pedestrians and bicyclists, and be prepared to stop if necessary. A conventional roundabout will have ONE-WAY signs mounted in the center island. They help guide traffic and indicate that you must drive to the right of the center island. Upon passing the street prior to your exit, turn on your right turn signal and watch for pedestrians and bicyclists as you exit. Left turns are completed by traveling around the central island. A couple of unanticipated bonuses on roundabouts have occurred to me recently. One, you never have to worry about signals being down due to power or technical issues. 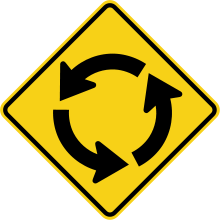 Second, if you go through a roundabout and realize you meant to turn off at an exit, you just drive around again and exit at the correct one (good for a busy Realtor who forgets where their next stop is). So love ‘em or hate ‘em, they’re here to stay. I do ask that you do everyone a favor, you still need to use you’re turn signal when exiting. That signals waiting drivers that’s it’s OK to proceed. Let me know what you think about roundabouts. Maybe you found another bonus we all need to hear. And that about rounds up this post (couldn’t resist). 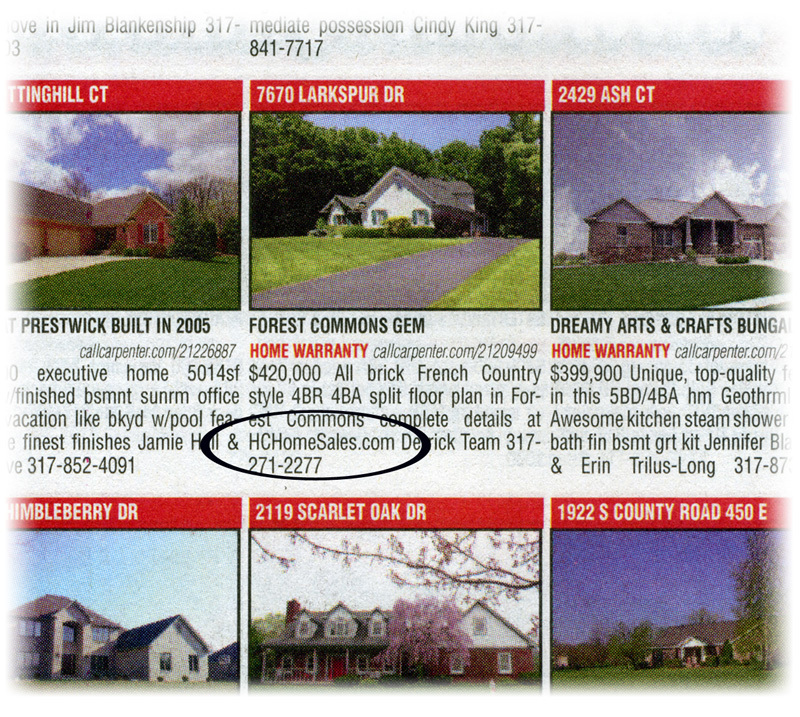 One of the many tools The Derrick Team utilizes to market our listings is the Call Carpenter Homes magazine. Our listings are added in there automatically by Carpenter when we list your home. But one thing that only The Derrick Team does is include a web site address in an ad so the reader can easily get more information on your home. 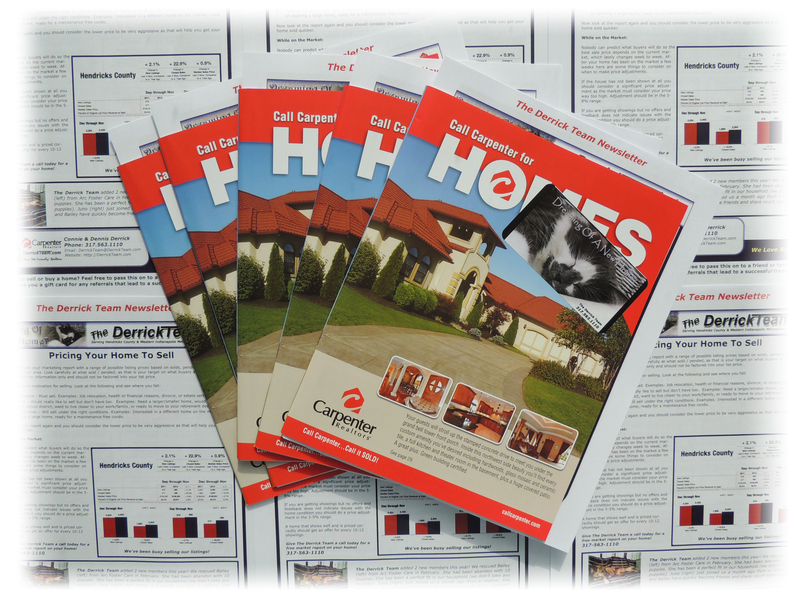 Carpenter prints the exclusive Call Carpenter Homes magazine bi-monthly filled with hundreds of Carpenter listings. We talk to many people who love to browse the magazine just to see what’s out there. The Derrick Team takes this one step further with a newsletter insert featuring local information along with our own listings. On a typical month we distribute between 300 to 400+ of the magazines with our insert. We deliver in neighborhoods, through stands in local businesses, and as hand outs in open houses and events like the Hendricks County Fair. So your home gets even more exposure locally to help you sell your home. Find the Derrick Team Newsletter & Call Carpenter for Homes Magazine at: Specks Pet Supplies on US 36 and Los Rancheros at CR 100N & 267 in Avon, Edwards Equipment on Main Street in Danville. Looking for business owners in the Avon / Danville area to co-market with. If you have or know someone with a area business with walk in traffic we’d like to invite your business with a free-to-you co-marketing opportunity! The Derrick Team is one of Hendricks County’s successful real estate teams with Carpenter Realtors and utilizes all forms of marketing, much of it unique to The Derrick Team. While we have a strong presence on the Internet, we also utilize traditional printed media to connect with the local community in Hendricks County and the Indianapolis western metropolitan area. We will be glad to include your business information and even provide ad space in our newsletter in exchange for a location to setup stand in your business. We take care of keeping the stand full with fresh stock. You just let us know what you would like to include. We can add flyers for your business in the magazines or a coupon in the newsletter. And we will do all the printing at no cost to you. We’ll even blog about your business to increase you own Internet presence. Now how often do you get to advertise like this for free? Call The Derrick Team today at 317-563-1110 for more information. Calling All Dogs! – Dogtona Time Again for 2012! Every year Hendricks County dogs get to enjoy the best event ever created, just for them by the Hendricks County Humane Society! Being held at the Hendricks County Fairgrounds – Hendricks Power Expo Hall so it can be rain or shine! The cost is $5 per Dog, but the people who bring them can enjoy the fun for free. Proceeds support the HCHS Dog Park Committee who have already done a lot for Hendricks County dogs! The Derrick Team be there shooting photos and videos and having a great time (we might bring Bailey). Watch videos from the previous fun days here. Indiana Property Tax Deductions – Are you getting all yours? As Realtors we often look at tax data, most importantly assessment value, in part of our Comparative Market Analysis (CMA). It’s not uncommon to find that the homeowner may not have a common deduction on their property taxes. The most important one, the Homestead Credit can mean a much higher tax bill if not applied to the property if it’s applicable. If you are the owner and you live in the home, you are eligible. Another common one is the mortgage deduction that is usually only $3000 or less but still, it’s a few more bucks in your pocket if it applies (you have a mortgage on the property). There also is a new process in which you must re-apply for your Homestead Credit to keep it in effect. In your last property tax statement there was a pink sheet that told you that all information must be updated by 2013 or you can lose this credit. In most counties you can do this online. I just did ours for Hendricks County at this link: Hendricks County Parcel Search. Just type in your address and find your information. Then on your property information page click on the Homestead Deduction button and fill in the information. You will get an email later confirming your Homestead Deduction has been OK’d from the auditors office. Only takes a few minutes and can save you hundreds of dollars. There are many others and I’ve borrowed a table from the Indiana Department of Revenue flyer and added it below. Look it over and if you have questions call your county tax assessors office to get more details. Many require a form to fill out and some documentation to prove your eligible. But in the long run it’s money in your pocket that is rightfully yours! 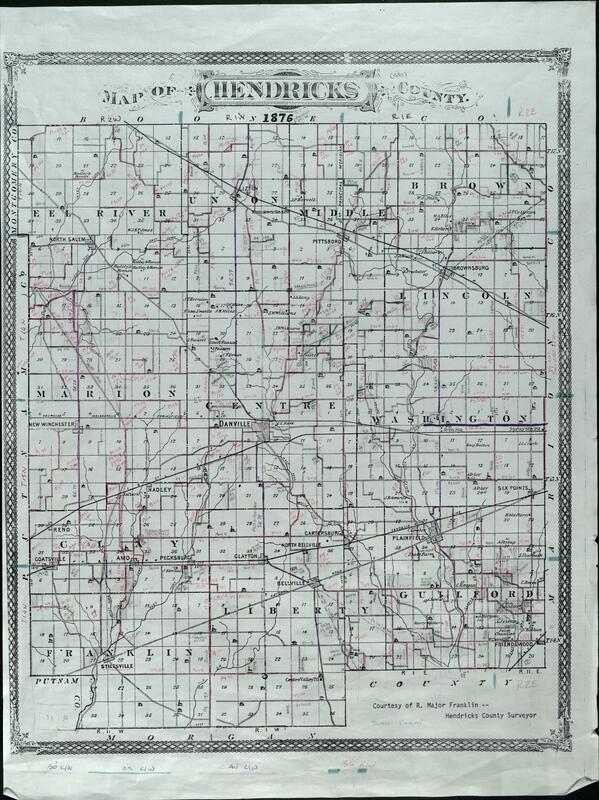 The act organizing the county of Hendricks was approved on December 29. 1823. 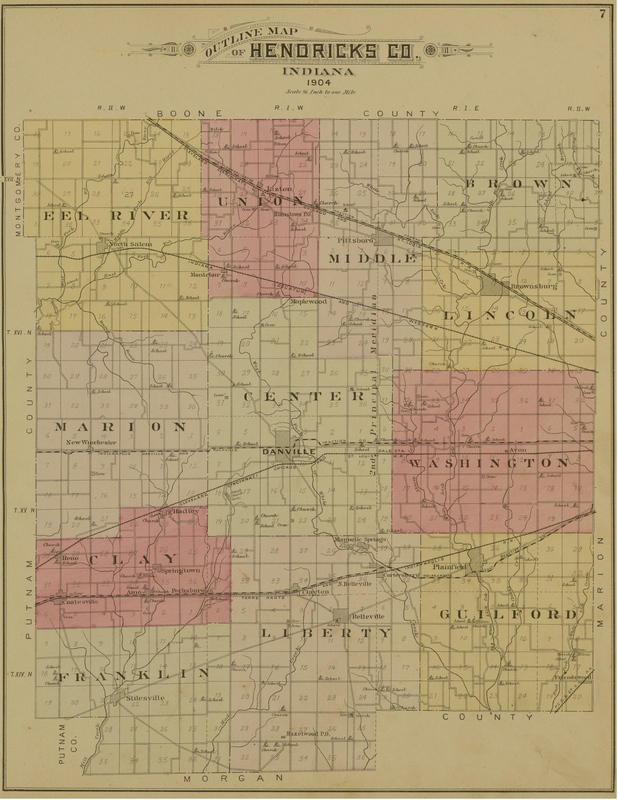 The county was named in honor of William Hendricks, then governor of the state of Indiana. According to the provisions of this act, the men selected began to investigate several claims made for the location of the county seat. Many localities were at work striving for the honor, among them the community near George Mattock’s tavern, two miles east of Belleville, where a town had been laid out named Hillsboro. This site was discarded in favor of a location as near as possible to the geographical center of the county, and on the second Monday in July, 1824, the site of Danville was chosen. Four men, Daniel Beals, George Matlock, Robert Wilson and James Downard, being the owners of land in four sections having a common corner, each donated twenty acres touching the common corner for the benefit of the county seat, all of which was laid out into public square and town lots. Thomas Hinton was appointed agent of the county, and on October 20, 1824, he placed on file a plat of the town of Danville. The lots were immediately put up at a public sale, and this continued for three days. An order was made by the commissioners for fifteen gallons of whiskey to assist the purchasers in making their selection. Samuel Herriman, the coroner, was the distributor on this occasion. The price paid for the lots ranged from three to one hundred and fifteen dollars. The latter price was given by Mr. Hulse for the lot on the northeast corner of Main and Washington streets. The lot on the southwest corner brought the next highest price. The court house was completed and the first term of court held in Danville in April of the year 1826. The building was constructed of peeled hickory logs and cost one hundred and forty-seven dollars. The jail was of the same material. The first county commissioners were Thomas Lockhart, Gideon Wilson and Littlebury Blakely. 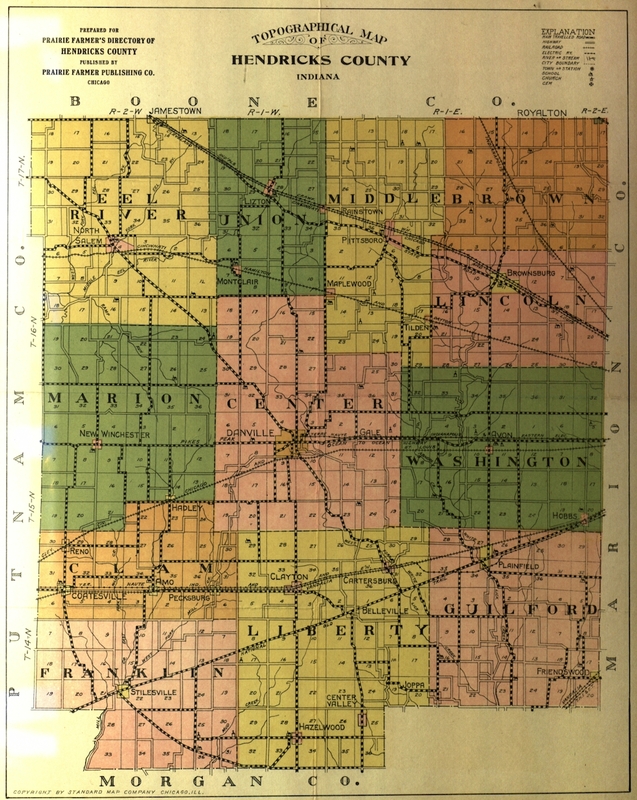 They divided the county into nine townships, of nearly equal area, and there was sufficient population in but four of the townships at that time to give them a civil organization. The first representative of the county in the General Assembly was Lewis Mastin. 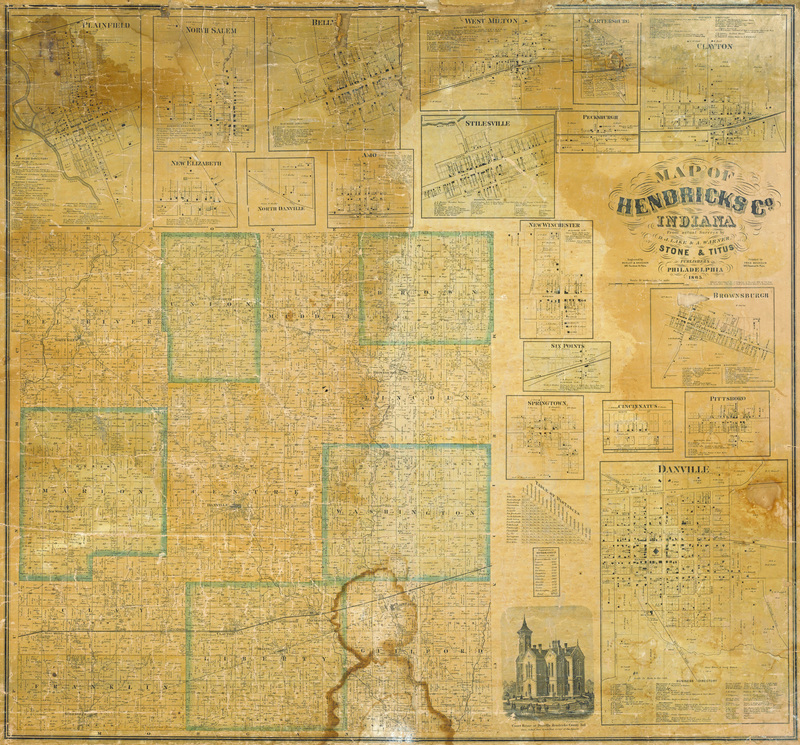 And thus the history of our government in Hendricks County was started…. Oak Bend Estates was developed in the late 1980’s in a nicely wooded hilly area with White Lick Creek (east fork) to the west, County Road 100 North to the south, and State Road 267 to the east. Oak Bend Estates is located in Avon, Hendricks County, Indiana. This area was commonly used in dairy farming until the 50’s and 60’s until dairy farming was not profitable on a small scale and most of the dairy farms sold their herd and went to straight agriculture. This hilly wooded area was thus mostly untouched as is was unsuitable for agriculture and contains many large mature trees so the homes are nestled in among a very beautiful natural setting. The first homes were built in 1988 with most homes built around 1990 time frame and the last one was complete in 1998. Oak Bend Estates was developed in 5 sections starting from the west side of the development and finishing with section 5 on the east end. The two entrances are on County Road 100 North and State Road 267 with many of the homes on cul-de-sacs. There are currently 180 homes with 2 home sites left to build on. Average assessed tax value for homes in Oak Bend Estates is $289,334 for the 2010 tax year. Over the past several years the average for homes sold was a little over $300,000 at $100 per square foot. All the homes are custom built with no two homes being allowed to use the exact same floor plan. This gives Oak Bend Estates a wide variety of styles used from newer all brick styles to homes with classic Victorian, Queen Ann, & Colonial styles. Oak Bend Estates is considered one of the finest neighborhoods to reside in the town of Avon. Take a drive though and you’ll see why. If you need to sell or buy a home in Oak Bend or anywhere in the Indianapolis Metro area be sure and text or call The Derrick Team at 317-563-1110. We work 7 days a week including evenings.